The August Doorbell Cam Pro is a sturdy smart doorbell that makes it easy to save and capture video footage. It’s a great companion to the August Smart Lock Pro; is compatible with Apple HomeKit, Alexa, and Google Home; and has a cool feature called HindSight, which retroactively records motion detection events. But its bulky design and potentially involved installation keep us from recommending the August above contenders like the Nest Hello and Ring 2. Dimensions: 2.9 x 2.9 x 0.8 in. >>Convinced already? Get the doorbell camera now. The August video doorbell doesn’t have as many bells and whistles—like facial recognition or a battery-powered option—as some other video doorbells. But it covers the basics with 980p HD video quality, a 160-degree field of view, clear two-way audio, and on-demand live video. It also has some standout features we like. HindSight is an innovative technology that constantly monitors your doorway. With this feature, the August Doorbell Pro records video a few seconds before a person approaches the door, capturing about 10 seconds of activity before motion is detected. It’s a thoughtful way to keep track of who’s coming and going in front of your house, whether it’s a delivery person, a dog walker, or a potential intruder. HindSight is a thoughtful way to keep track of who’s coming and going. In practice, though, HindSight is a bit glitchy. Some August Doorbell users say the HindSight feature is often delayed or doesn’t work at all. Others complain that the doorbell’s motion sensor sometimes recognizes objects and people only from far away. The August Doorbell Pro’s built-in floodlight gives you full-color HD playback, even at night. The light itself isn’t overly bright, but it’s bright enough that you can see who’s at your door in the evening. On top of that, you can adjust the brightness of the light. If you already have the August Smart Lock, pairing the August Doorbell Cam is a sensible choice. You can sync the doorbell to the smart lock, so when you see a guest you know on your doorstep, you can unlock the door from your smartphone. Installing the August Doorbell Pro requires some basic wiring and drilling, but it’s a straightforward process, making it a great pick for handy DIYers who are comfortable wielding a drill and doing some light electrical work. We also like that the August Pro comes with a USB dock that lets you charge the doorbell’s internal battery and test its compatibility with your Wi-Fi network before you install it. That’s not something you’ll see with many other smart doorbells. When it comes to the actual installation process, you can use the same wiring your existing system uses. But just make sure it’s not a digital doorbell—the Pro Cam requires a mechanical chime inside the house. Otherwise, it won’t sound when someone comes ringing—you’ll just get a notification through the August app. Before you buy, make sure your existing system is compatible. You’ll need a 12- to 24-volt wired doorbell system. The August Doorbell Pro retails at $199, the same price as both the Ring Video Doorbell 2 and the SkyBell. But the Ring and SkyBell have a couple more features than August, including a higher video quality. When it comes to keeping track of your footage, August offers a couple options. The Basic Video Recording cloud subscription lets you access and replay your videos from the last 24 hours for free. It also lets you download and share saved videos, and it applies to all users of the Doorbell Cam—which means you, your partner, and your tech-savvy kids can all access those recordings. Premium Video Recording plan – $4.99/mo. With a Premium Video Recording subscription—priced at $4.99 a month or $49.99 annually—you’ll get access to 30 days of saved video history. If you’re out of town a lot, or if you want to hold onto clips for longer than a day, it’s a good get. 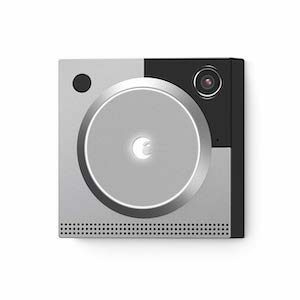 The August Doorbell Cam is our favorite doorbell for video capture. Its innovative HindSight feature makes it stand out from the competition, the camera is easy to install, and we love the HD color night vision. Plus, if you already own or plan to own the August Smart Lock Pro, the doorbell would make a great addition to your setup. But if saving video footage isn’t your top priority, or if you’d rather have a camera with security integration or smart features like facial recognition, we recommend another option from our picks for best doorbell cameras. If you want the latest technology, the Nest Hello is a great pick that offers cool features like face recognition. SkyBell offers a lot of the same great specs as August, but it also integrates with a lot of security systems, which August doesn’t. >>Keep a constant eye on your doorstep. Buy the August Doorbell Cam Pro here, take a look at our Ring review, or check out our full list of picks for smart doorbells.